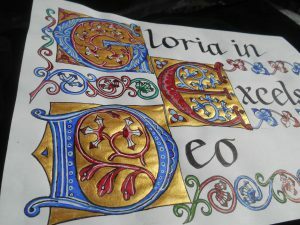 Create a Capital Letter of extraordinary beauty, using The Gothic Script! Gild your work with fine Holbein gold. This Workshop includes calligraphy. Treat yourself to an exceptional day, surrounded by some of the finest manuscript illumination from Medieval England! Cost: £37.00. incl. coffee & a delicious lunch and pudding from Hilary. Specialist materials and expert tuition provided. If you have any dietary requirements, please let me know. Please send cheques for £37.00 made payable to Judith Richardson-Dawes, to 30, Chute Street, Newtown, EXETER, EX1 2BX.